Place the noodles in a bowl and cover with boiling water. Set aside for 8 minutes or until tender, drain. 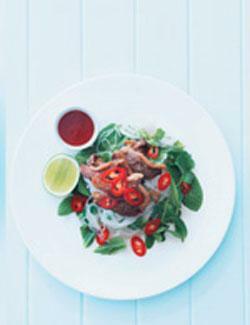 To make the crispy chilli duck, toss the duck in the combined chilli, flour, salt and pepper. Heat enough oil over highheat in a frying pan to shallow-fry. Add the duck and cook for 1 minute each side or until crisp and golden. Drain on absorbent paper. Toss the noodles with the mint, basil and coriander. Combine the juice, fish sauce and sugar and pour over the noodles. Top with the duck and serve with chilli, chilli sauce andlime wedges.